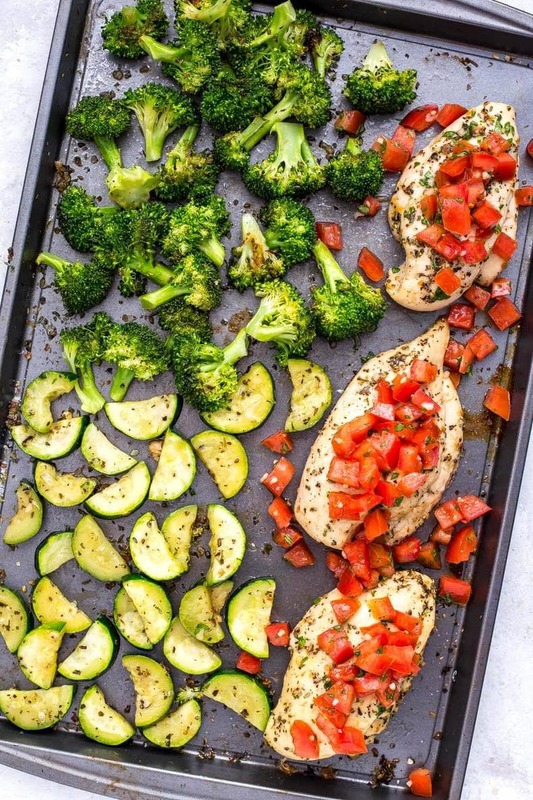 This Sheet Pan Bruschetta Chicken with broccoli is a healthy one pan dinner idea and one of my favourite healthy summer meals. It's also a delicious way to enjoy your favourite appetizer as a high-protein meal! Preheat oven to 400F. Drizzle chicken breasts with a bit of olive oil (about 1/2 tbsp) and season with salt and pepper and 1/2 tbsp of Italian seasoning. Bake in oven for 15 minutes. Meanwhile, combine all ingredients for bruschetta and set aside. Remove chicken from oven and add broccoli and zucchini to baking sheet, tossing with about 1/2 tbsp of olive oil, 1/2 tbsp of Italian seasoning and seasoning with salt and pepper. Bake another 12-15 minutes until chicken is fully cooked. Remove baking sheet from oven and top chicken with bruschetta. Serve and enjoy!